Did you know that protecting your identity is largely in your own hands? Fifty-six percent of identity theft victims traced the theft to something that was stolen from their own possession. 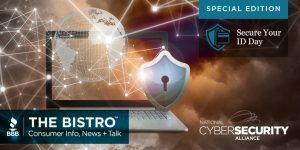 April 22nd is Secure Your ID Day and National Cyber Security Alliance Executive Director, Michael Kaiser joins us to discuss the importance of protecting your identity. On Saturday, April 22, 2017, BBBs across North America will host this helpful identity theft prevention event featuring FREE on-site shredding, electronic recycling, plus tips on protecting your identity. Click here to find a list of the participating BBBs. Excellent post. I was checking constantly this blog and I’m impressed! Extremely useful information specially the last part 🙂 I care for such information a lot. I was looking for this certain info for a long time. Thank you and good luck.